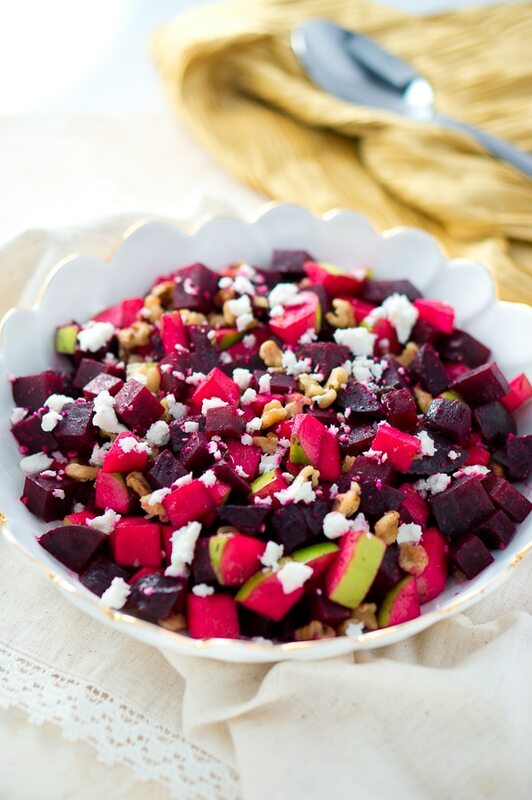 Simple and elegant roasted beet and apple salad, walnuts, feta cheese, and maple vinaigrette. Beautiful dish for your Thanksgiving or holiday table. I recently made this salad but I used a simple lemon juice and olive oil dressing. It was very delicious and looked great on the table. I think it will be a great side dish to bring to any holiday table. Today I decided to make a maple vinaigrette to add more sweetness to this dish. 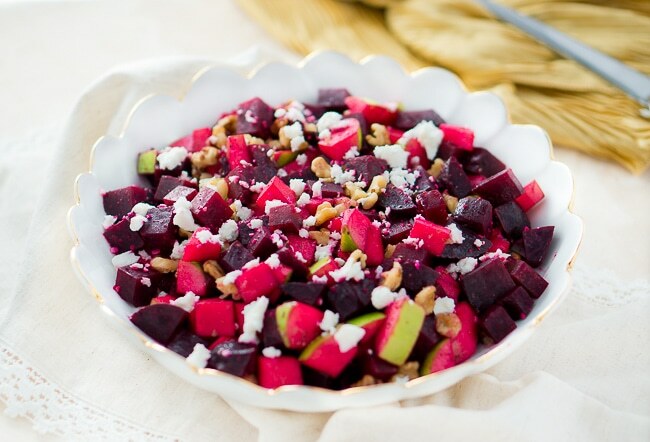 The flavors of this roasted beet and apple salad are delicious and complex. 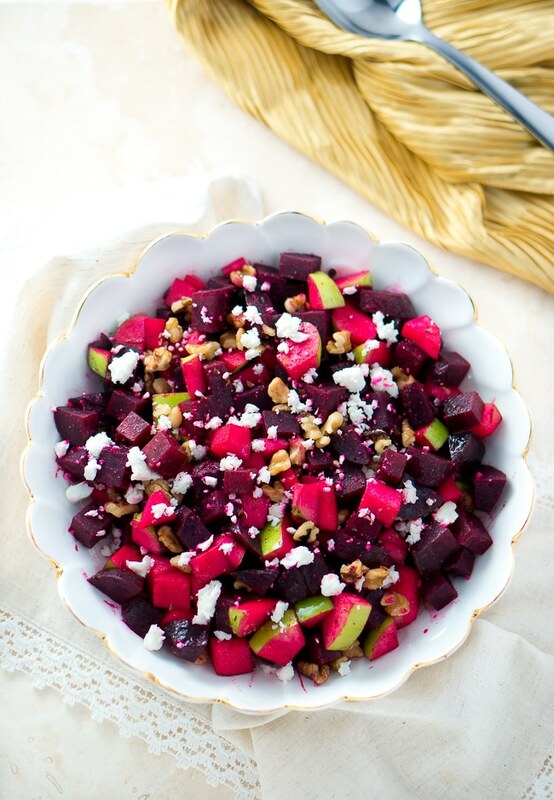 The dressing is amazing and adds so much flavor to the beets & apple combination. I think beets are so underrated. But they are so delicious when cooked right. Preheat oven to 425 F. Trim beets leaving 1 inch of the stem. Coat lightly with olive oil. Wrap tightly in aluminum foil and place on a baking sheet in the preheated oven. Roast until tender and easily pierced with a knife, about 1 hour. Remove from the oven and let cool for about 10 minutes. Slip off the skins with a paring knife and cut the stem. Dice beets in 1″ cubes. Mix beets, chopped apple and olive oil in a mixing bowl. Season with salt and freshly ground black pepper to taste. Transfer to a salad plate, top with chopped walnuts, crumbled feta cheese and a little bit of maple vinaigrette. Mix all ingredients and stir until well combined. 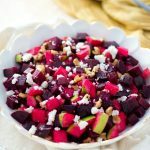 Roasted Beet and Apple Salad - Simple and elegant roasted beet salad with apples, walnuts, feta cheese and maple vinaigrette. Beautiful dish for your table. Slip off the skins with a paring knife and cut the stem. Dice beets in 1" cubes. I’ve had apples and beets as a salad garnish before, but never tried them as the main event! This sounds like a really interesting recipe! I love the flavors in this salad, a little sweet and savory. Sounds perfect. This would totally be my husbands dream salad…beets and feta, two of his favorites! I’ll have to add this to our menu next week! SERIOUSLY mouth watering salad. POPPING WITH PURPLE! Delicious! I love roasted beet salads, I’ve ordered them the last two times we’ve been to a restaurant. Love the addition of the apples for flavor and crunchy texture! Oh the colours in this salad. I want to dig right in. Knock me out! That’s such a pretty salad. Beets are great and putting them with apples is a new idea for me to try. yum!! It’s gorgeous! Love the vibrant purple color! I love beets, this sounds like a delicious preparation especially with that maple vinaigrette, yum! I love the taste of roasted beets! With the crunchy apple and creamy feta this is a knockout salad! What a colorful salad. Poor beets have gotten a bad rap and now they are coming back into favor! Great recipe. I absolutely love all flavors you’ve got in this salad! Yum, looks fantastic! The first time I made this dish, it was a hit, even though I had to substitute white wine vinegar for the champagne vinegar. The recipe is too delicious to have it make 6 servings – more like 3 servings for us. Will definitely make again. Awesome! So glad you liked it, Harry!